A neighbor’s surveillance camera captured an Arizona woman driving straight into her bicycle-riding boyfriend, a collision that seriously injured the victim and resulted in the woman’s arrest for attempted murder. 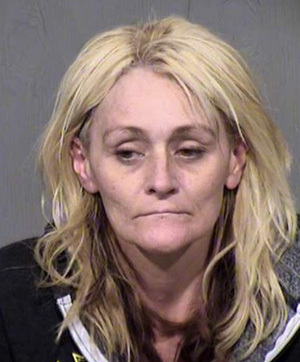 Seen above, the video shows Misty Lee Wilke, 44, slamming into the victim on a Phoenix street. The impact sends the man over the hood of Wilke’s 2012 Ford Mustang. Investigators allege that Wilke targeted the victim after learning that he was HIV positive. The April 29 incident left the man with head trauma and a fractured vertebrae. Wilke, seen at right, told police that she had “recently become involved in a sexual relationship” with the victim, adding that the couple argued after she learned of the man’s HIV status. “He was laughing at her and Misty admitted to pushing the victim,” according to a probable cause statement. Wilke, who has been jailed since her arrest, was indicted last month for attempted murder and aggravated assault with a deadly weapon. As part of the police investigation, cops last month executed a search warrant on Wilke’s vehicle.